Casey Codding is a traitor. Casey Codding murdered Lavoy Finicum. Thanks to recent testimony we know the activist’s death was a pre-planned assassination. But corrupt judges along with government officials have sealed the identity of the Oregon State Police (OSP) Officer directly responsible for the murder of Lavoy Finicum. Despite public outcry, trials against protestors and even charges against one of the FBI agents for the filing of a false report in the murder, the man who pulled the trigger has been known only as Officer #1. However, today someone leaked the name of the OSP officer behind the slaying. 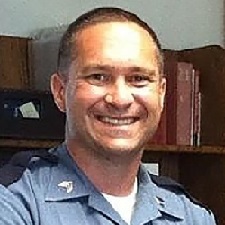 The real name of officer #1 is CASEY CODDING (a/k/a – Casey Michael Codding), and this is a photo of him. Casey is not denying the killing, and he is being praised by other government traitors for his actions. In fact he is being praised as a hero for helping the FBI and other OSP officers setup an illegal roadblock to ambush and kill the activist Lavoy Finicum. He is the man that murdered Lavoy Finicum. If that isn’t enough to turn one’s stomach, then this might,. . . Casey has since been promoted to the rank of captain. As members of the human race we should all demand that Casey Codding answer for his crimes and be given the due process he and his treasonous friends have denied Lavoy Finicum. Furthermore. it’s time we stop and put an end to these unlawful fake courts and their secret trails, for ‘We The People’ have the right to know the names and faces of the criminals that violate our highest laws and murder our families. CLICK HERE to read about Lavoy Finicum and how he was murdered. CLICK HERE to read about the FBI agent who lied about firing two rifle shots at the truck of Lavoy Finicum.